Each Card is 8x6cm.You will receive the complete 20 card set. 20 Card Set. 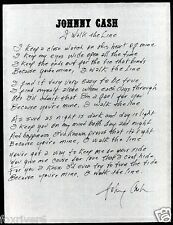 047/959 -JOHNNY CASH Handwritten Lyrics 'I Walk The Line'. A page of handwritten lyrics for 'I Walk The Line'. Signed by Johnny Cash. Signed at the bottom and the writing is clearly in the hand of Johnny Cash. Johnny Cash KRNT Theater 1966 Concert Poster Framed or 3 Print Options NEW EXCL. 1 X PERSONALISED STEEL HIP FLASK IN THE SHAPE OF A GUITAR. JOHNNY CASH LUXURY PERSONALISED GIFT SET. A STUNNING, LUXURIOUS AND PERSONALISED COLLECTORS SET FOR JOHNNY CASH FANS. IF YOU DO NOT ADD A NOTE TO YOUR ORDER WITH (UP TO 8 WORDS) WE WILL DISPATCH PLAIN. JOHNNY CASH. 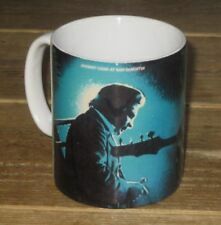 THE ULTIMATE JOHNNY CASH COLLECTABLE FOR ALL FANS. SIGNED AUTOGRAPHED PHOTOGRAPH. This one is for 60 copies SLP1235 Johnny Cash - Sings the Songs that Made Him Famous. 30 copies SLP1260 Roy Orbison - At the Rockhouse. 30 copies SLP1255Johnny Cash - Now Here's Johnny Cash. Listed in good faith to the best of my knowledge and abilities. Johnny Cash Pocket Watch & Keyring and Wooden Stand. JOHNNY CASH SILVER PLATED Signature Pocket Watch & 'Man in Black silver plated Keyring Gift Box and a beautiful hand-crafted polished wood pocket watch display stand. JOHN LENNON LUXURY PERSONALISED GIFT SET. 1 X JET BLACK PERSONALISED GUITAR SHAPED STEEL HIP FLASK. A STUNNING COLLECTORS SET FOR JOHN LENNON FANS. THE FULL HUNTER POCKET WATCH WITH MATCHING CHAIN REAL GOLD PLATED featuring a JOHN LENNON signature reproduced from an original to the front of the watch. This one is for 25 copies SLP1270 Johnny Cash - All Aboard the Blue Train. Listed in good faith to the best of my knowledge and abilities. Invoice No. 13738. Th March 1979. The condition is very good minus. Good = Apparent wear and tear but with obvious deterioration of the condition. Excellent = Minor wear yet looks attractive and is perfectly usable. Artist: JOHNNY CASH. 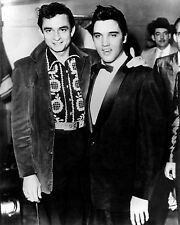 Title: JOHNNY CASH SHOW. Format: TICKET. Year: 1983. Professionally mounted Johnny Cash Signed LP (The Johnny Cash Show). For Sale is an original autographed Johnny Cash LP. The red & white bevel provides an excellent contrast to really make the LP cover and record stand out. ITEM IS IN VERY GOOD CONDITION. Approx size Original item. ====>> FAST DISPATCH ! Approx size Original item. ====>> FAST DISPATCH ! This is a rare and complete set. Film released January 1971. This will be displayed on our screen when we process your order. We will take every care in the production and dispatch of your order. Unique 35mm film cell displays. Stars of Stage, Screen and Music. Limited to just 50 pieces worldwide. These mugs are extraordinary in clarity and have vibrant, beautiful colours. This will give it an excellent reproduction in both colour and sharpness. ceramic coffee mug. Each mug has a full individual photo either on front and back or full wrap around. Glossy Photograph. This photograph has been developed in a professional photographic studio using the highest quality Weighted photographic paper. The front case features the Sun Records insignia with Johnny Cash's signature diamond cut into the steel casing. Johnny Cash Sun Records Rose Gold Pocket Watch. This beautiful Pocket Watch has been plated 18k Rose Gold. From our ` Stoned Love ` print collection, limited edition of 295. A large range of different hand designs & colours & a choice of ticking or none ticking is available. The clock face itself is a black gloss painted drum skin featuring Johnny cash in white with gold and silver numbers & dots around the edge. Johnny cash chord book very good. UP FOR GRABS IS A PROMO PHOTO OF THE MAN IN BLACK - JOHNNY CASH. GENUINE BANKNOTE PAPER - HOLOGRAM - DOUBLE SIDED. JOHNNY CASH. STUNNING TRIBUTE. A UNIQUE TRIBUTE TO ONE OF THE. ORIGINAL - FIRST RELEASE - MUSEUM GRADE. JOHNNY CASH SIGNED 24k GOLD CLAD POCKET WATCH. BEAUTIFUL 24K GOLD CLAD FULL HUNTER POCKET WATCH HOUSED IN LUXURY GIFT CASE. FULL HUNTER POCKET WATCH WITH MATCHING CHAIN REAL GOLD PLATED featuring a JOHNNY CASH signature reproduced from an original to the front of the watch. Reproduction of classic Johnny Cash record label. Strong adhesive backing, so can be stuck anywhere: wall decoration; guitar case, laptop, record box, on the side of a speaker etc.